The latest market report by PMR on the global pineapple powder market evaluates the opportunities and current market scenario, and provides insights and updates about the corresponding segments involved in the global pineapple powder market during the forecast period 2018-2027. The global pineapple powder market report further exhibits the estimated data for 2018, and forecast data up to 2027 in the terms of value (US$ Mn) and volume (MT). In the terms of value, the global pineapple powder market is expected to grow at a healthy CAGR of 7.1% over the forecast period. The present study exhibits the trends and market dynamics of the pineapple powder market in six major regions - North America, Latin America, Western Europe, Eastern Europe, Asia Pacific, and the Middle East & Africa. The report also includes the study of the current issues with consumers, and various future opportunities for the pineapple powder market. The report explores the global pineapple powder market for the period 2018–2027. The primary objective of the global pineapple powder market report is to provide insights into the opportunities in the market that are consistently supporting the transformation of global businesses that are associated with pineapple powder. It is very important to consider that, in an ever wavering economy, we provide the estimated (Y-o-Y) year-on-year growth rate in addition to the Compound Annual Growth Rate (CAGR) for the overall forecast, to better understand the analysis and evaluation of the global pineapple powder market, and to discover equitable opportunities. Yet another key feature of this report is that, the estimation of the global pineapple powder market and the corresponding revenue forecast are carried out in terms of absolute dollar opportunity. This is usually not prioritized while forecasting overall market numbers. Absolute dollar opportunity analysis is very essential in evaluating the degree of opportunity that a provider can observe to execute, as well as to contrast the potential resources from a sales perspective in the global pineapple powder market. The global pineapple powder market report starts with an detail executive summary, market definition of various segmentations that are included, and their respective shares in the market. The report further incorporates the major macro and micro-economic factors that have an effect on the growth of the pineapple powder market. The report also highlights market dynamics, which includes the drivers and restraints in the global pineapple powder market. Current opportunities as well as on-going trends in the pineapple powder market are also discussed in this report. The report further underlines the overview on technology used for industrial processing, and opportunities for the pineapple powder market. It also encompasses a supply chain analysis, which provides a structural view of the overall profitability from the manufacturer to the end user in the pineapple powder market. In order to provide users with a clear view of the global pineapple powder market, we have exhibited a competitive analysis of key market players and their strategic expansions. The competitive dashboard presents a detailed comparison of pineapple powder manufacturers on valuable parameters such as key product offerings, total revenue, key developments, and key strategies. The study intensifies the global pineapple powder market attractiveness analysis by nature, technique, end use, distribution channel, and region. To evaluate the overall market size of pineapple powder, the report considers various fundamental aspects based on secondary research. Furthermore, it emphasizes quantitative evaluation such as market shares by nature, technique, end use, distribution channel, and region, and other qualitative data from primary respondents, which have been consolidated to arrive at clear and accurate market estimations. The market size was benchmarked taking into consideration global pineapple consumption. Global pineapple juice consumption was deduced by splitting global pineapple consumption data obtained from sources such as FAO, ITC, and research publications. The average use of pineapple juice to obtain pineapple powder was analyzed through key market insights from company reports and research publications, and was used to triangulate the process. The forecast presented in the pineapple powder market report was based on twelve key market parameters of global pineapple powder market. Detailed profiles of companies that manufacture pineapple powder are included in report for analyzing the key aspects of the market such as their developmental strategies, key product offerings, and recent developments, as they have a significant role in the global pineapple powder market. Some of the market players covered in the pineapple powder market report are NutraDry, FutureCeuticals, Paradiesfrucht GmbH, Foods & Inns, DAMCO Phytochem & Research LLP, Morriko Pure Foods Pvt. Ltd, Shaanxi Dongyu Bio-Tech Co. Ltd, Hainan Nicepal Industry Co., Ltd, Aarkay Food Products Ltd., Modernist Pantry, LLC, and Harmony House Foods, Inc., besides others. Pineapple is a tropical fruit, and is known for its flavor and nutritional values. Pineapple is popular fruit that is mostly consumed fresh or as a canned fruit. The growing demand for pineapple in market has led to product diversification. Today, pineapple powder is consumed in various forms such as pineapple juice, concentrates, canned pineapples, dried chips, cocktail-type drinks, dried powdered, isotonic mixtures, bars, flakes, etc. Pineapple powder is a yellowish and free-flowing powder that is made by removing the free water present in pineapple juice or puree using various techniques. Pineapple powder carries a natural flavor and taste, and also retains all the nutritional qualities of the pineapple fruit. Pineapple powder is loaded with valuable nutrients such as antioxidants, vitamin C, manganese, vitamin B- complexes, copper, etc. Pineapple powder consists of a unique digestive enzyme known as 'bromelain', which is naturally present in pineapples, and is known to provide numerous health benefits to humans. Pineapple powder is easy to translocate as well as incorporate in various dishes, and thus, is largely used in various processed as well as ready-to-consume food products. Thus, with numerous applications and the increasing popularity of pineapple flavor, the demand for pineapple powder in global market is expected to increase substantially in terms of value and volume over the forecast period. The global pineapple powder market is estimated to create an absolute dollar opportunity of around US$ 328.9 Mn by 2027 over 2018. The conventional segment, under nature, is expected to experience substantial growth in the global pineapple powder market. The market in North America is expected to have a substantial share in the global market over the forecast period. By nature of pineapple powder, the conventional segment is expected to hold a prominent share, and dominate the market during the forecast period, owing to easy availability as well as cheaper cost of conventional pineapple powder. However, the organic segment is expected to grow at a high CAGR of 9.8% over the forecast period, owing to the increasing demand due to the on-going 'move-to-organic' trend. Among the techniques used for the preparation of pineapple powder, the spray drying segment is a prominent segment, owing to the large use of spray-dried pineapple powder due to lower cost and lesser processing time. By end use of pineapple powder, the convenience food segment has a substantial market share in terms of value as well as volume, owing to the growing popularity of convenience food, especially pineapple flavored smoothies and ready-to-consume juice mixes. The business to business segment under distribution channel is expected to remain dominate in the global pineapple powder market, owing the increasing use of pineapple powder in various processed food products. The increasing popularity of pineapple flavor in various food ingredients is having a positive impact on the global pineapple powder market. The growing demand for pineapple-flavored products is, in turn, increasing the demand for pineapple powder across the globe. The increasing demand for convenience food, popularity of pineapple flavor, and the rising awareness about the health benefits provided by pineapple fruit are some of the prime drivers of the global pineapple powder market. Lower shelf life and difficulty in transporting are some drawbacks of fresh pineapple as well as pineapple juice. Pineapple powder has a longer shelf, is easy to transport, and has the same flavor and nutritional value as pineapple. Thus, a majority of food processing manufacturers tend to opt for pineapple powder, as such, leaving a positive impact on the global pineapple powder market. The growing demand for natural products as well as natural food additives is another positive factor for the growth of the pineapple powder market, as there is no need for the addition of preservatives. Increasing health consciousness among people is another factor driving the growth of the pineapple powder market. On the other hand, high cost and processing time, erratic supply and quality of raw material affecting produce quality, and lower awareness in untapped and underdeveloped areas are some factors hindering the growth of the global pineapple powder market. The global pineapple powder market can be regionally segmented into Asia Pacific, Latin America, Western Europe, North America, Eastern Europe, and the Middle East & Africa. North America is a prominent market in the global pineapple powder market. 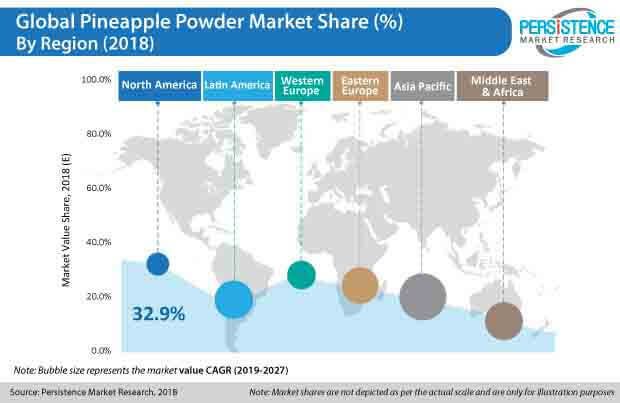 North America currently holds the largest market share in the global pineapple powder market, and is expected to continue to do so over the forecast period. The growing demand for functional food products, food products with health benefitting additives, and the growing demand for convenience food & beverages from the large working population are some of the factors that are boosting the consumption of pineapple powder in North America. Western Europe follows North America in value share of pineapple powder, owing to the increased demand for healthy food, especially from EU5 countries. However, the market in Asia Pacific is expected grow at a rapid pace and exhibit a high CAGR during the forecast period. The growing number of emerging players, increasing number of health conscious people, and increasing working population leading to the increased demand for convenience food & beverages are some of the prime factors that are driving the pineapple powder market in Asia Pacific. The markets in Latin America as well as Eastern Europe are expected to exhibit rapid growth in the global pineapple powder market. Owing to all these factors, the global pineapple powder market is expected to grow positively in terms of value and volume over the forecast period.